Fentanyl is single-handedly one of the strongest opiate drugs in existence. It, however, is not long lasting. The opiate Fentanyl is oftentimes used as anesthesia for surgery and surgery recovery. Sometimes, it is even used for breakthrough pain. This means that if an individual is already taking an existing opiate drug but gets no relief from their pain, they may be prescribed fentanyl. Fentanyl is 50 to 100 times stronger than morphine. Furthermore, the drug Fentanyl is said to even be 25 to 50 times more potent than heroin. The formulations in Fentanyl are designed to provide strong pain relief over time. The forms of such drug generally come in two forms: a lollipop and a patch. Fentanyl may also come as a small strip that is used by being dissolved under the tongue or as a pill that is taken by being lodged inside the cheek. In a more professional environment, such as Hospitals, fentanyl can also be injected. If this type of drug is abused outside of the hospital for recreational purposes it will be potentially dangerous to the abuser. As with most prescription drugs, there is a huge gap between the therapeutic use and a deadly dose. If using this opiate in any other way than as directed, it can mean the difference between medicine and poison. All drug addictions come with something in common: symptoms. The main symptoms of Fentanyl abuse include extreme mellowness, lethargy, and euphoria. This specific drug creates tolerance in its users very quickly. As little as one dose is enough to sustain a high for as long as one week and will require much higher doses a few days later. Addiction typically results in weakening the abusers’ integrity. That is, your unfortunate loved one may turn to unethical or criminal acts to obtain the drug by any means necessary. They may go to lengths such as stealing money, prescription fraud, doctor shopping (meaning going to several different doctors to have the same drug prescribed for various reasons) or any other crimes. Especially seen with prescription opiate pills, it’s common for patient addicted to certain drugs to hop between doctors to try to get more medications. Additionally, users may lie to their doctors about how much they are using. They might have excuses for running out before they do. Different individuals tend to get form addictions at different paces. That is, some drug abusers try to prevent their addiction by allowing some time to pass between their use. However, some others feel obligated to continuously use the drug once they have started. Different factors differentiate the progression of addiction, whether that be to opiate prescription drugs like Fentanyl, or other things like alcohol, street drugs, narcotics, etc. Like the most abused opiate drug, heroin, Fentanyl binds to opioid receptors in the brain rapidly. The binding to opioid receptors causes euphoria and a decrease in the sensation of pain (analgesia). The difference between heroin and Fentanyl, however, is the dose it requires to feel such euphoria, and the speed from which each can be felt. Fentanyl is dangerous in the fact that it takes merely micrograms to feel the effects, whereas heroin takes milligrams. Additionally, Fentanyl reaches the brain receptors much quicker than heroin. Therefore, if the dose is not carefully administered, results can be deadly. If someone familiar with abusing heroin tries to take the same dose of Fentanyl as they would heroin, overdose is almost certain. 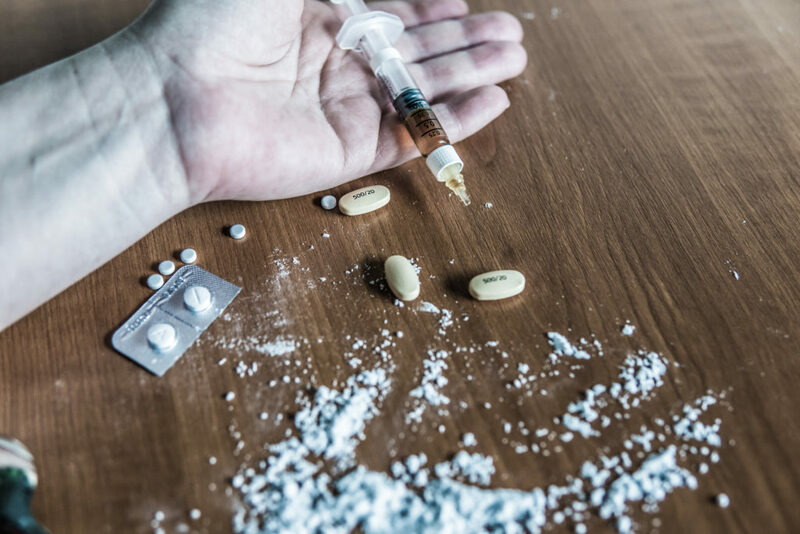 Fentanyl causes your central nervous system to slow down the rate of its functions and causes breathing rates, heartbeat rates, and digestion rates to decrease drastically. These functions occur when the user starts to experience the high feeling and starts to feel more relaxed and drowsy. This is where the danger lies. Severe depression in these respiratory organs can lead to a lack of oxygen getting to the brain, which may lead to coma, brain damage or even death. Many people who are under the strong influence of this drug, after building up a tolerance, tend to start using the drug in higher doses. Also, they may start mixing the drug with other substances in order to get a greater high. Most opiate drugs, especially Fentanyl, tend to not mix well with others. Mixing such drugs can often end up leading to an accidental overdose. Opioid overdoses are typically treated by taking the drug, naloxone. This temporarily stops an overdose by not allowing the drug to get to the brain receptors. However, the use of naloxone has a double standard, as if not taken properly or with the proper medical intervention, it will lead to an overdose rather than stopping it. Fentanyl, like other drugs, will cause internal damages, especially for those abusers who have gone ahead and experimented with the drug by mixing it with others. Since Fentanyl may also come in powder form, some persons cook with it or mix it with cocaine or even use it to lace their marijuana. Doing this increases the damages on your internal organs such as the liver and kidneys. Eventually, this mixing of drugs could end up leading to the shutdown of your brain. If you or your loved one is an abuser of this opiate, please also be wary of physical damages such as oral and throat damage. Smoking Fentanyl will also cause damage to the lungs in a similar way that cigarettes and meth does. Snorting it, just like snorting cocaine, will cause damages to the sinus tissues and mucous membranes. Injecting the drug can lead to skin infections, blood infections as well as cardiovascular infections. Being an addict to a drug of any sort can pose a threat to your overall health and safety as well as those around you. If you or your loved one is undergoing a battle with addiction, please do not hesitate to seek help urgently before it is too late. Contact Prevail Intervention for any questions or concerns you have. We can help you or a loved one place in an inpatient or outpatient treatment center that’s right for you. Call our 24/7 addiction and mental health helpline.